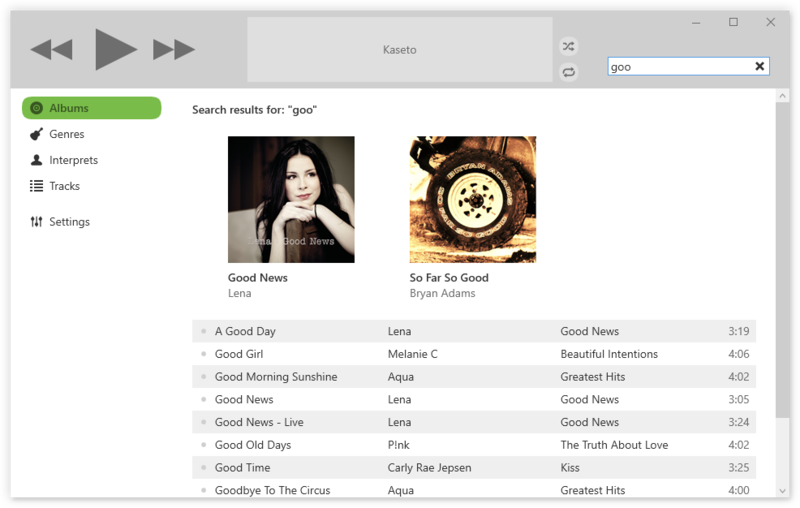 The new version of Kaseto provides a search function for albums and songs. A further new feature is the possibility to change playhead position of the currently played song. Loading and updating the music collection will be visualized as a progress in the taskbar now. The search box is located on the top right in the header of Kaseto. Already while typing a few letters, Kaseto will start to search matching albums and songs, and show them instantly. Usually it is enough to type the first letters of an album, title or interpret for finding the right one. The search can be closed by clicking on the X icon in the search box or by pressing the Esc key. Now the progress bar, which shows the progress of playing in the header, is clickable. This means that playhead position of the currently played song can be changed. For example, a song can be rewind to the middle by clicking on the center of the progress bar. The exact position will be shown as tooltip. The progress of initial loading of the music collection or when Kaseto detects new audio files at startup will be visualized as a progress bar under the Kaseto icon in the taskbar. In Kaseto, the loading and updating of audio files will be always executed in the background. The music player is fully usable in the meantime.